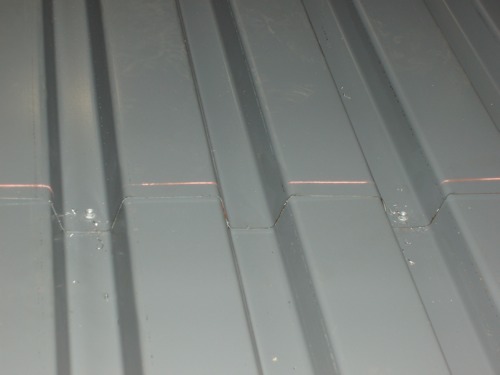 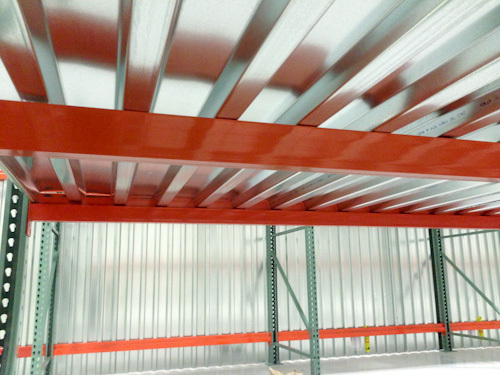 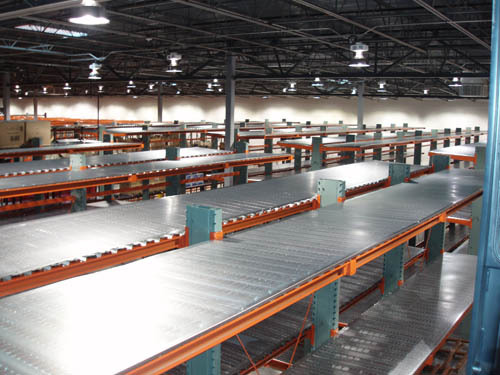 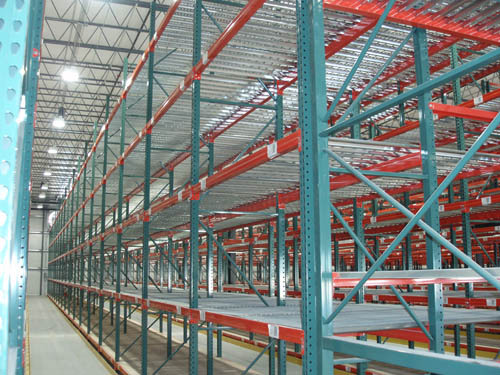 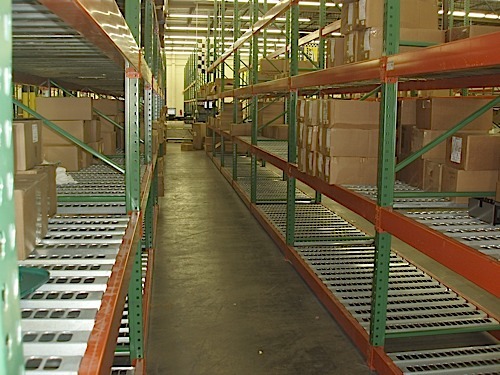 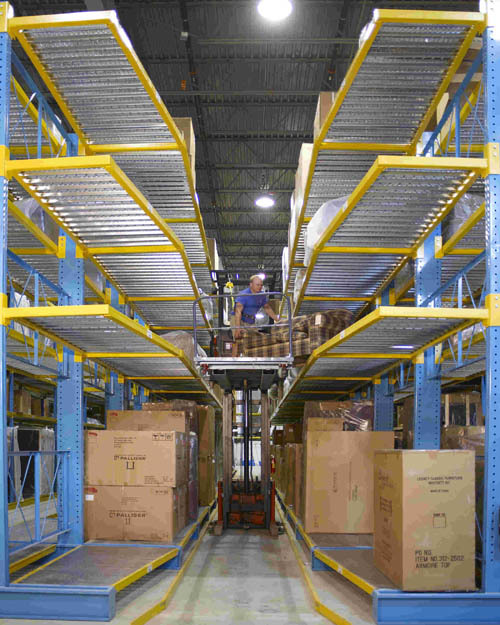 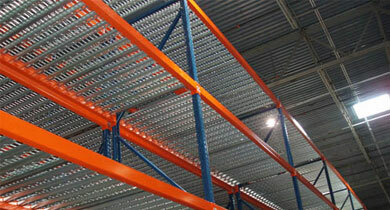 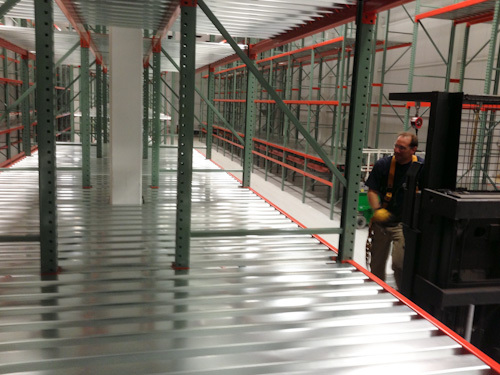 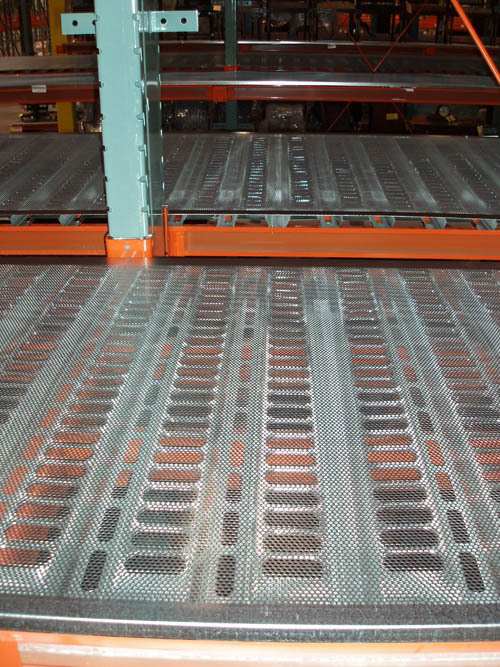 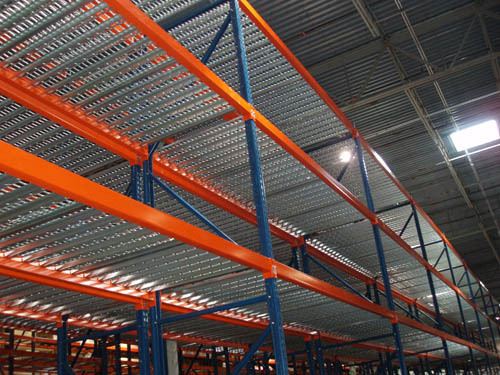 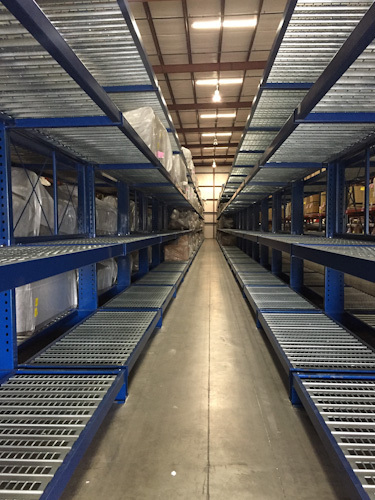 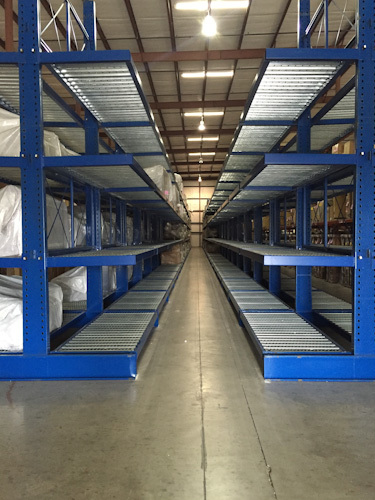 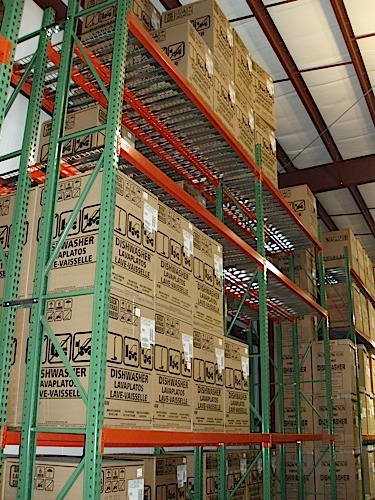 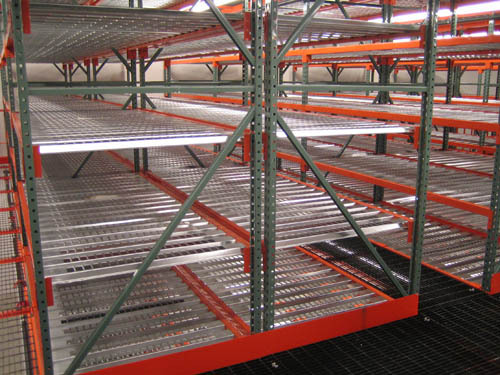 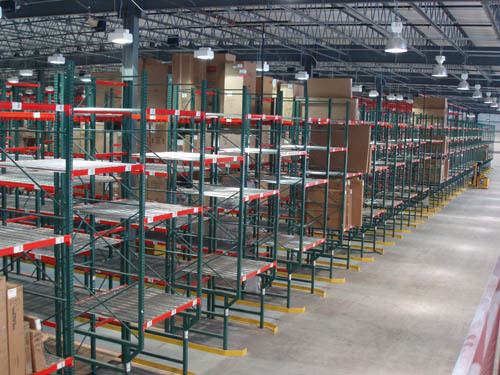 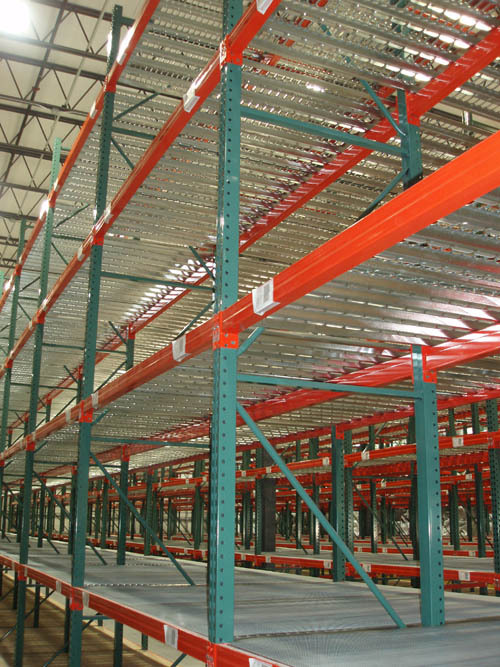 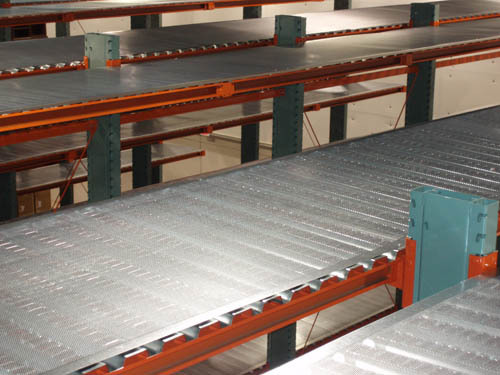 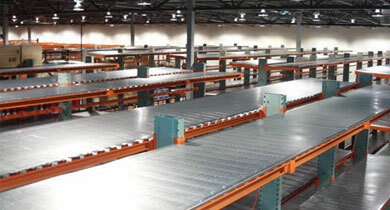 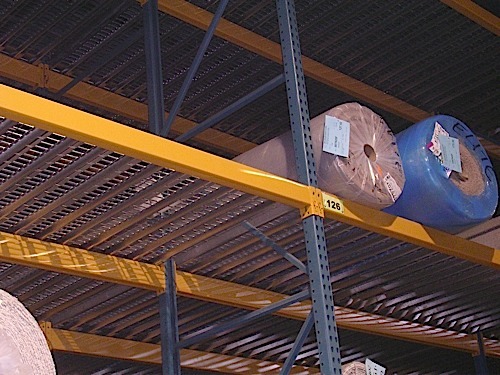 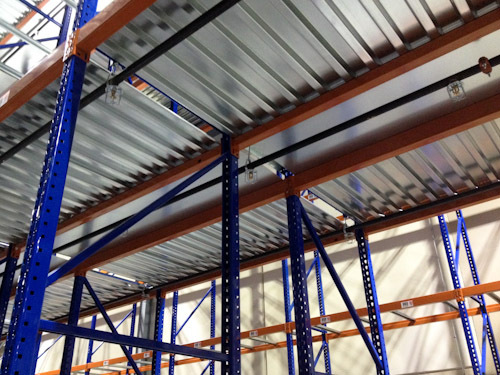 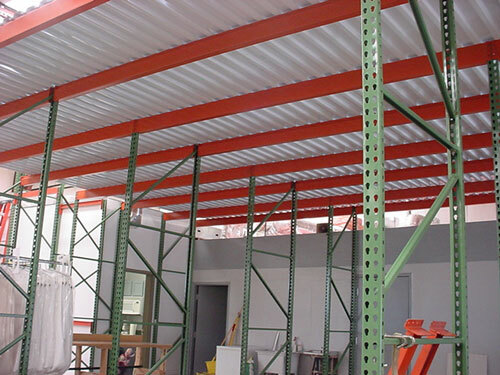 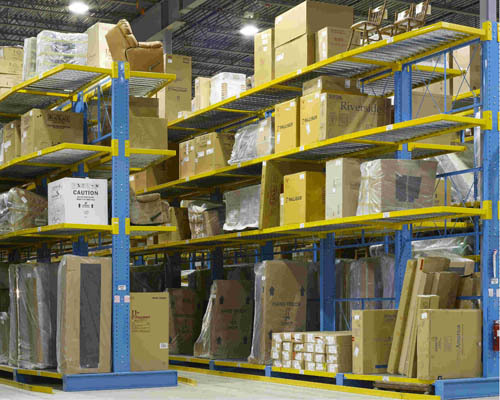 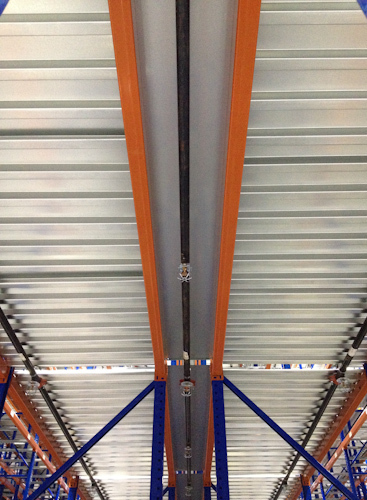 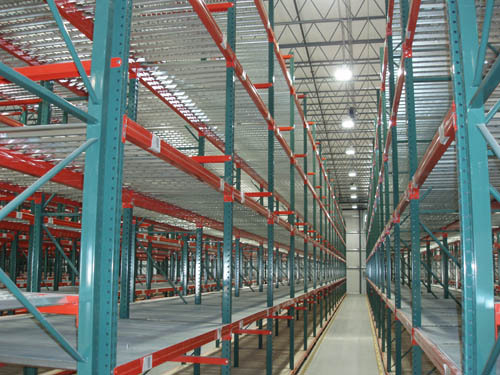 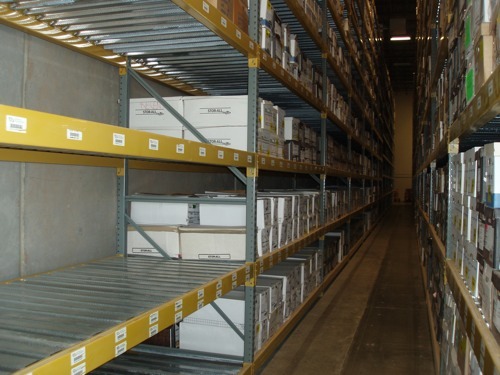 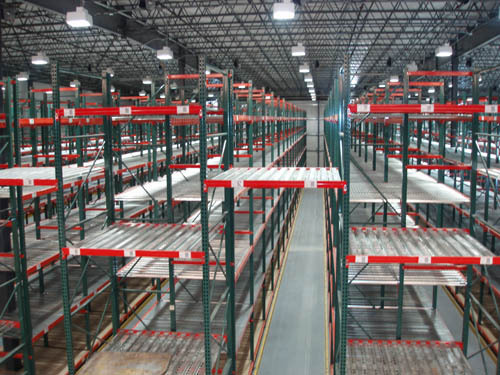 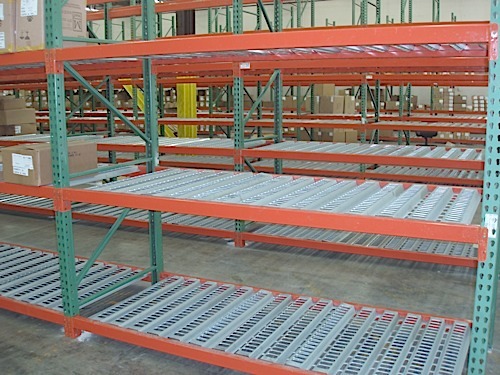 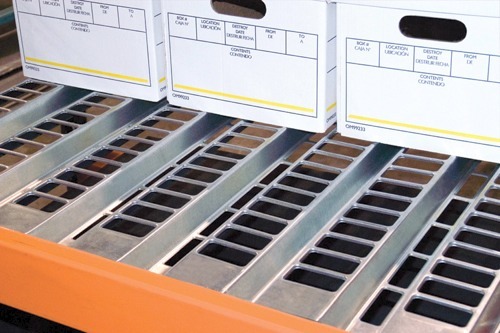 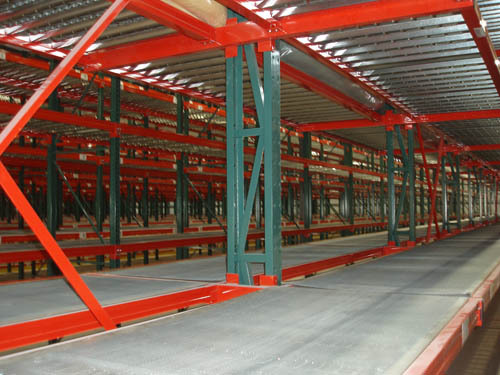 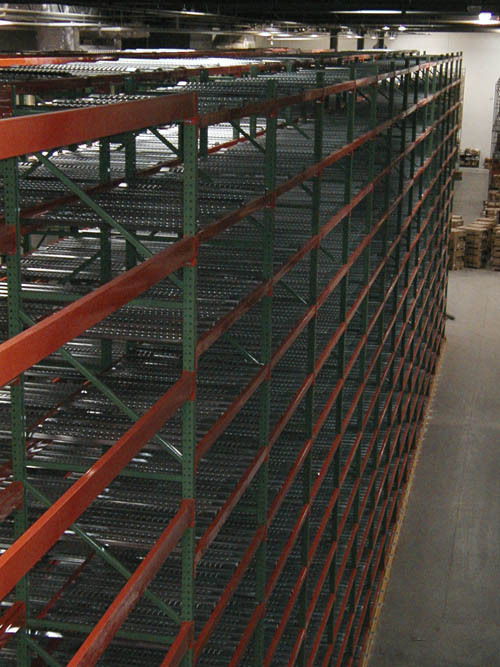 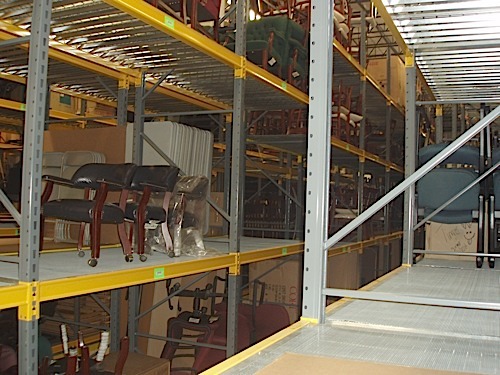 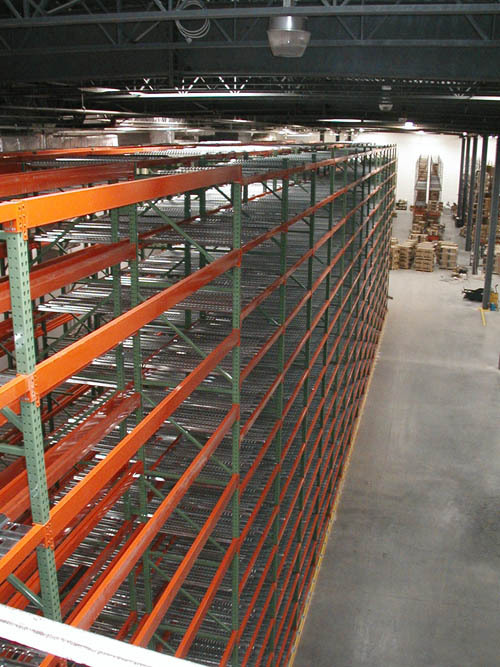 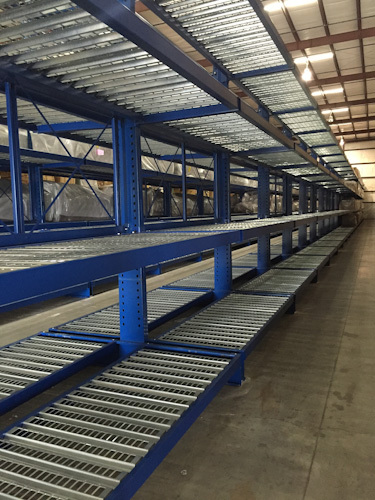 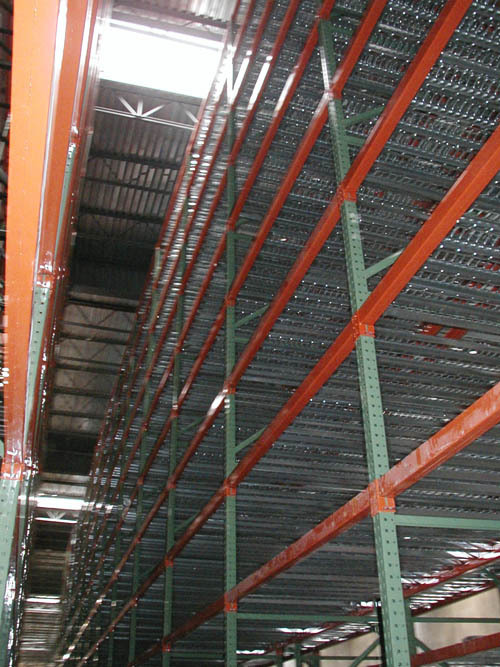 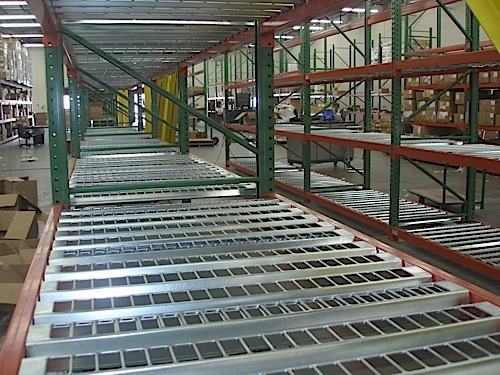 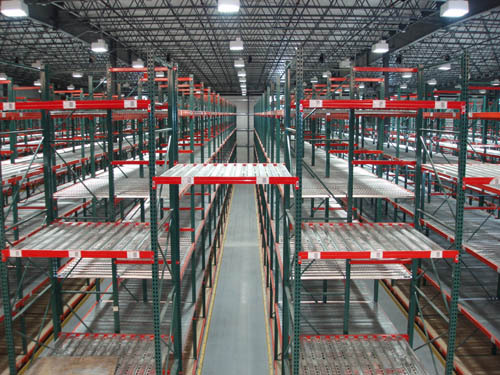 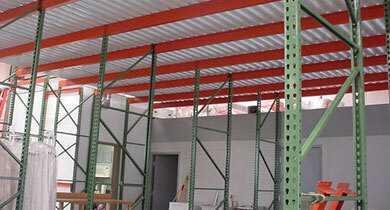 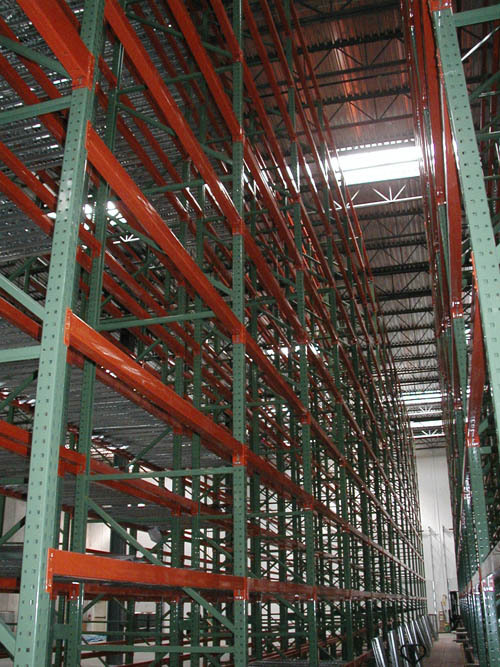 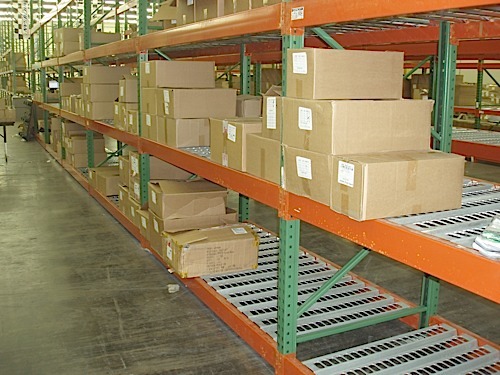 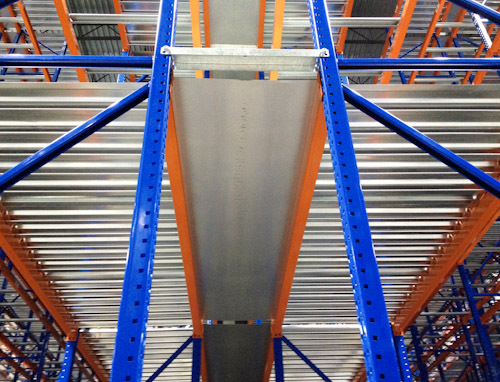 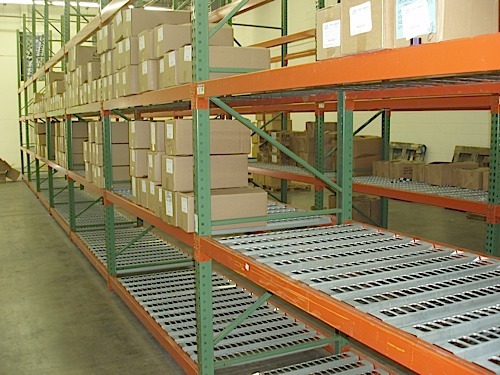 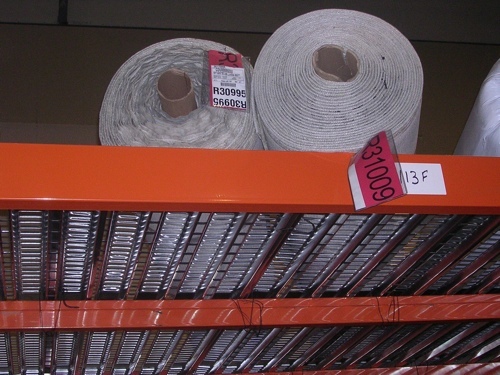 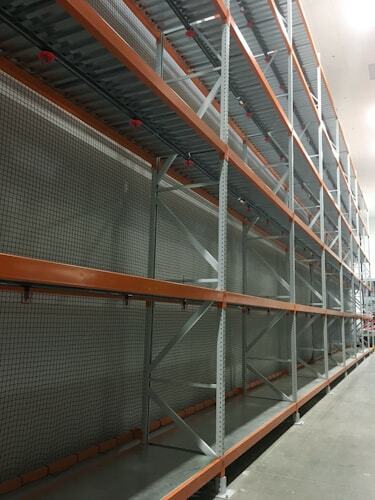 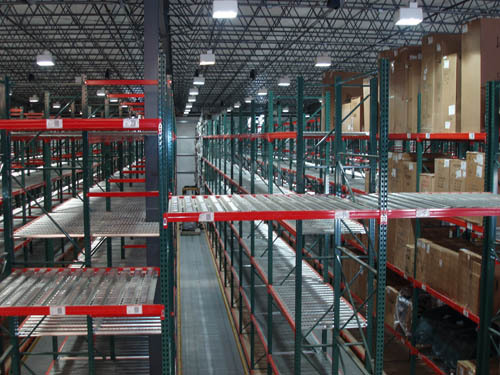 Our precision roll-formed steel decking is cut-to-length to fit flush inside any pallet rack brand beams. 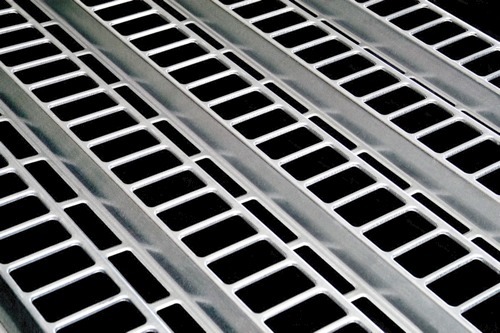 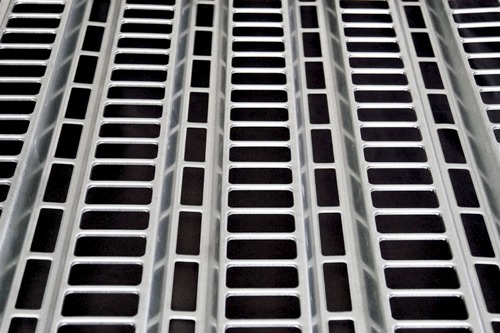 The Punch-Deck style is our Open Area hole pattern design, which allows the largest flow rate of sprinkler water to flow through the decking to levels below. 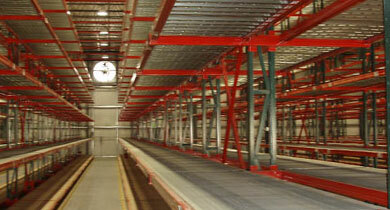 Designed to meet the NFPA (National Fire Protection Association) guidelines. 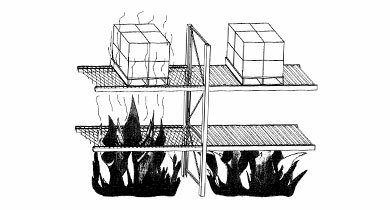 Extensive load & fire tests (U/L, FL fire labs, SW fire, etc.) 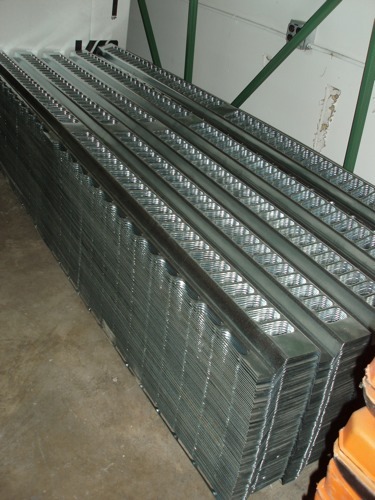 have demonstrated repeatedly the performance of the decking design. 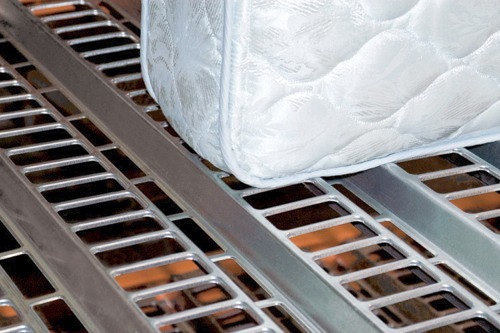 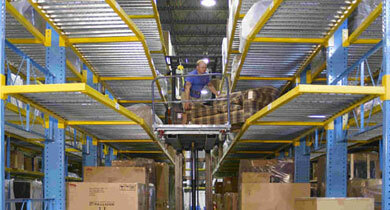 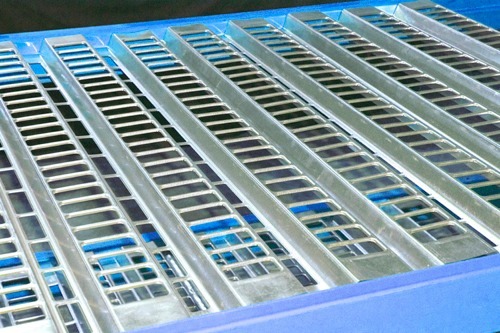 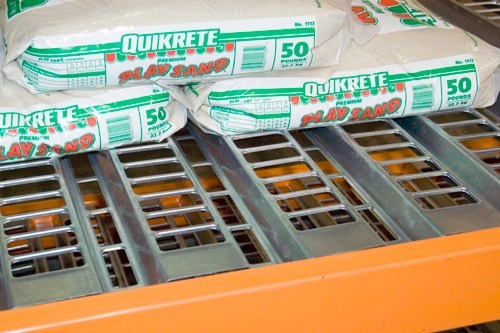 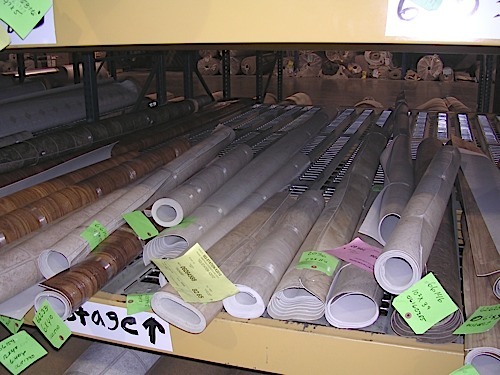 Easy slide on & off surface reduces product damage and snagging which also reduces operator fatigue. 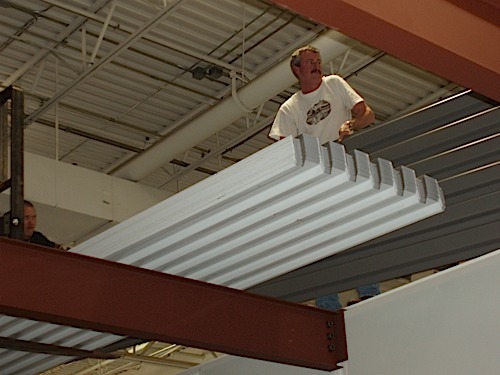 Available in 22 ga., 20 ga. & 18 ga. All with a long-lasting, durable, galvanized steel finish. 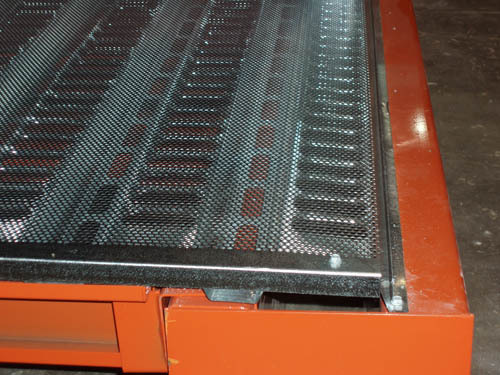 The Punch-Deck Plus, perforated flat-cap is an accessory, add-on to the Punch-Deck pallet rack decking. 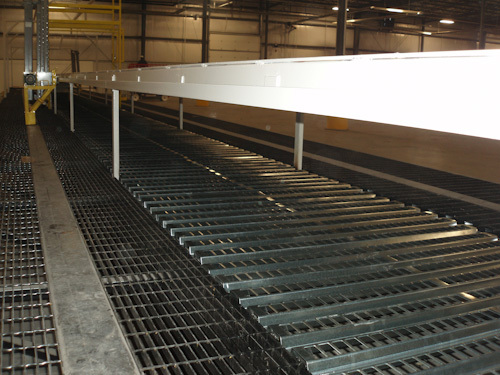 Punch-Deck Plus is designed for those applications that require a smooth flat-surface and water drainage capability. 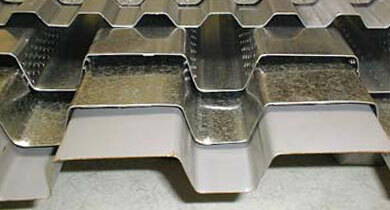 The flat-caps are perfect for product that have a small footprint that would fall through other styles of decking. 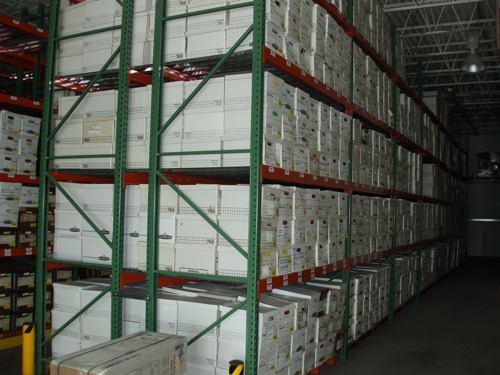 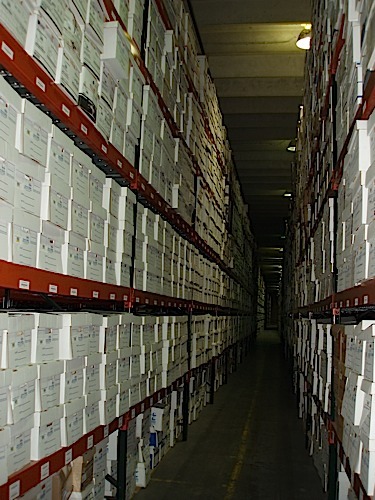 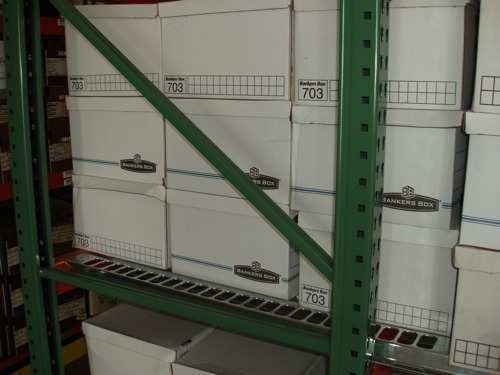 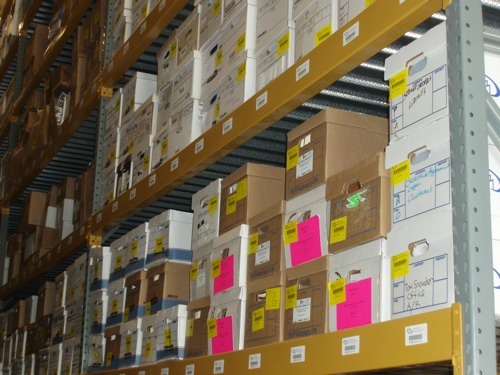 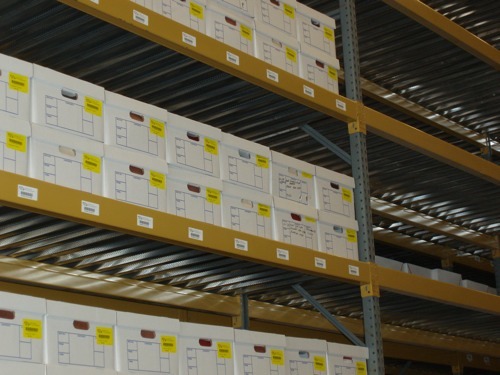 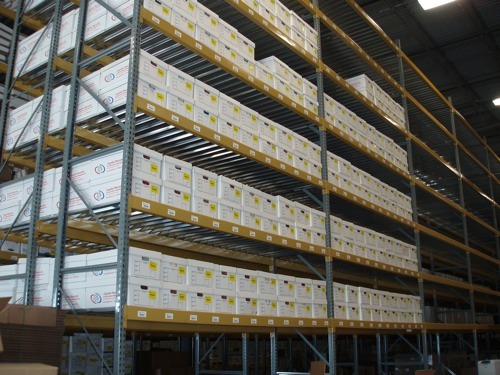 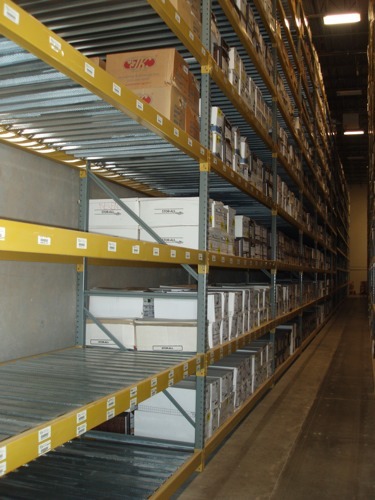 See the Photos section for examples of applications or our Literature Download section for additional details. 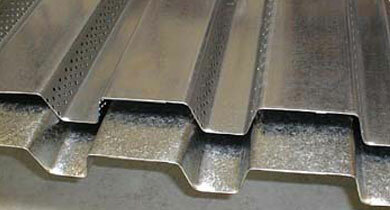 Roll-formed in a variety of steel gauges and panel widths, and cut with our standard +0" - 1/8" cutting tolerance. 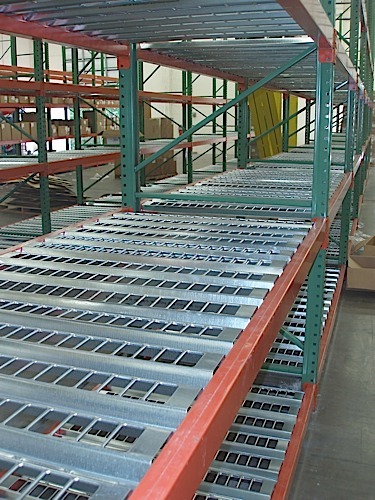 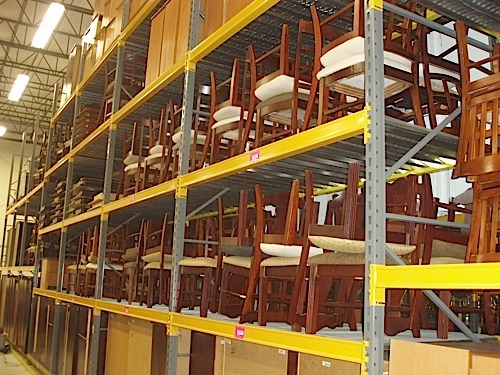 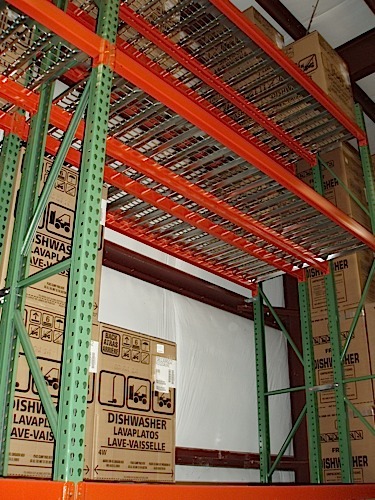 Designed to fit in any pallet rack brand. 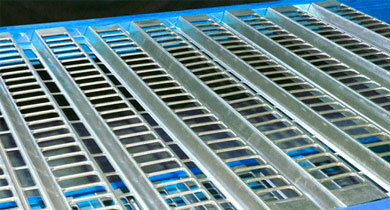 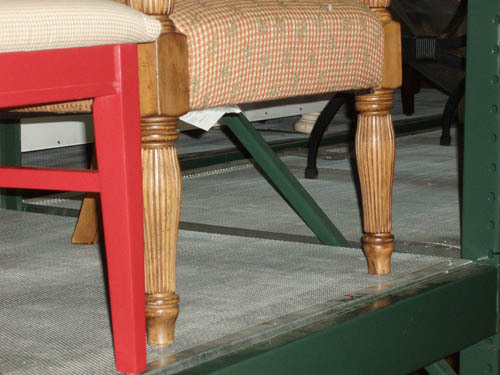 The top of the decking sits flush with the top of the rack beams for an easy product slide on and off. 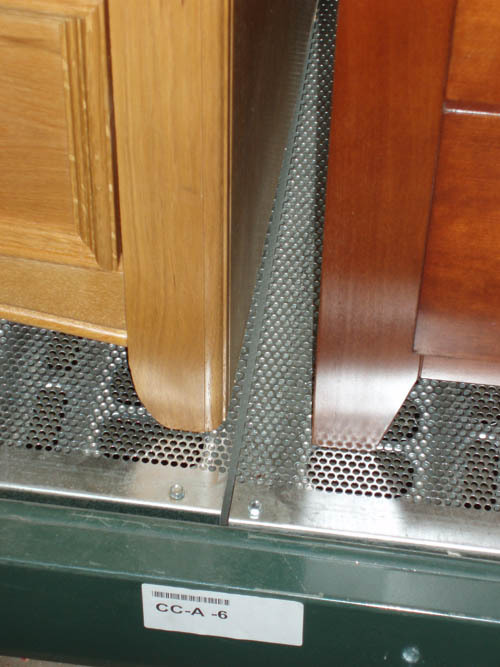 The decking may also be perforated with smaller holes in the “valleys” of the decking for water drainage. 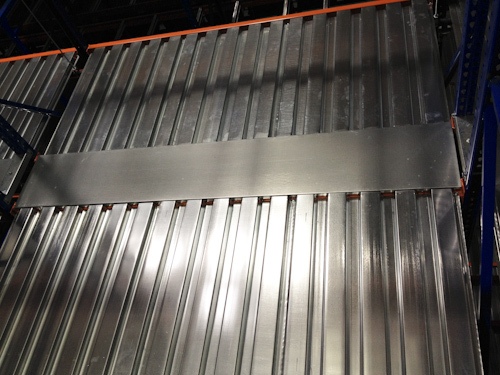 The panels are quick, and easy to install. 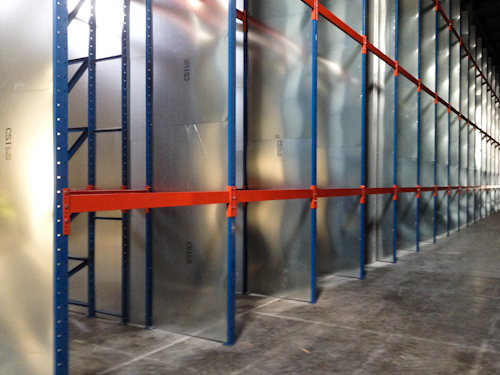 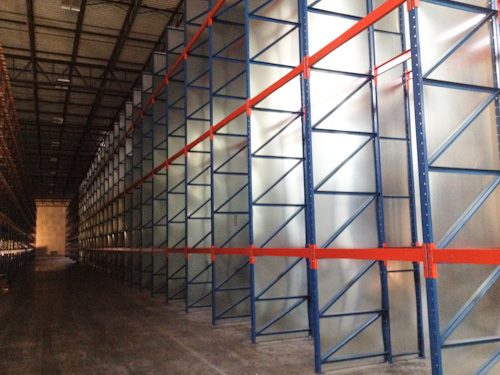 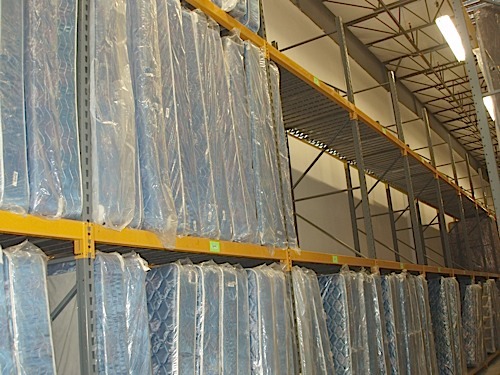 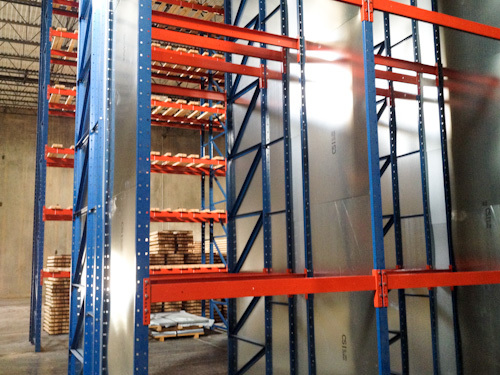 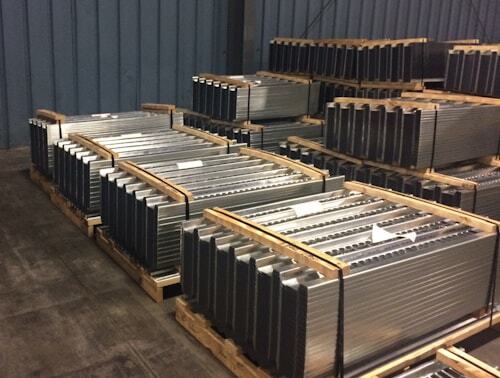 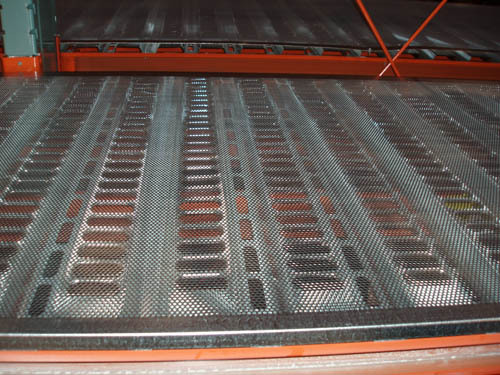 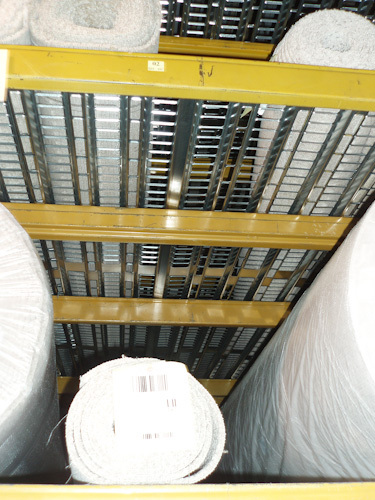 The panels ship in dense bundles for low freight costs. 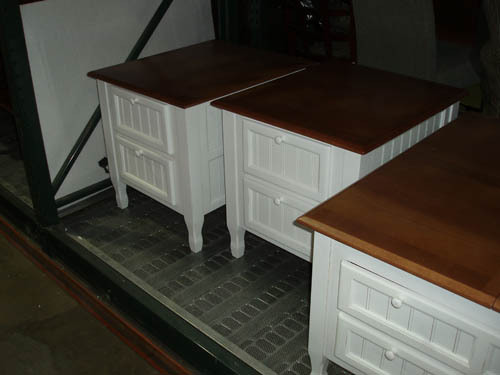 They are available in Light, Medium and Heavy Duty designs. 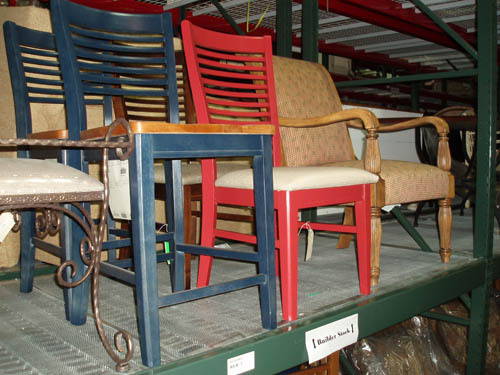 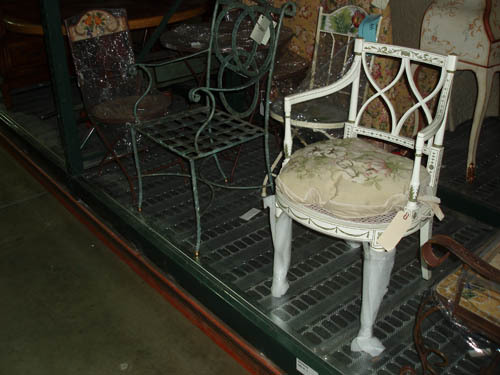 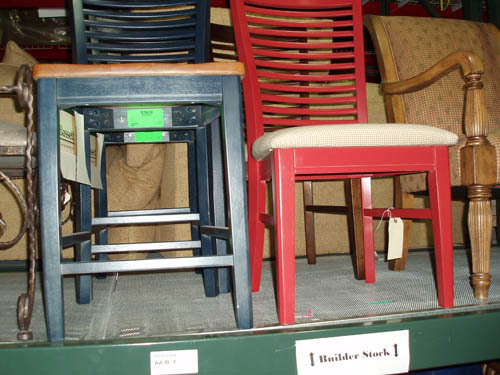 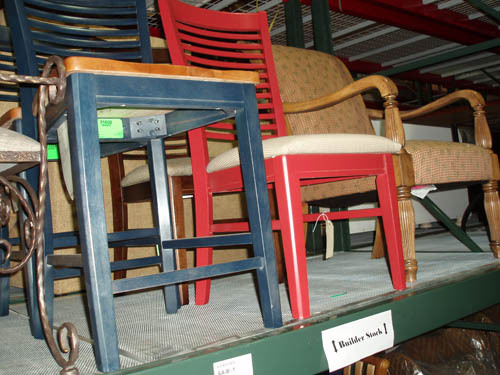 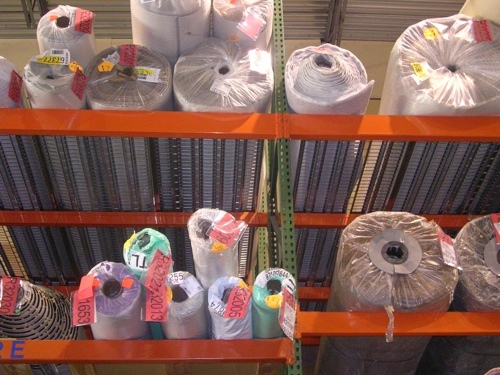 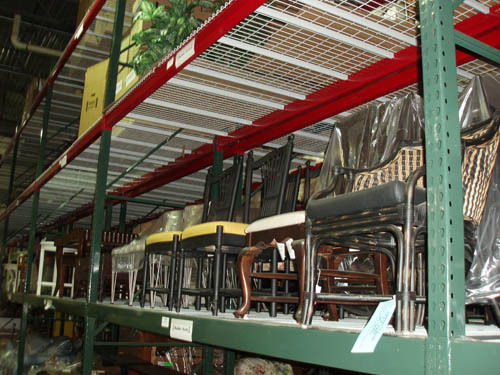 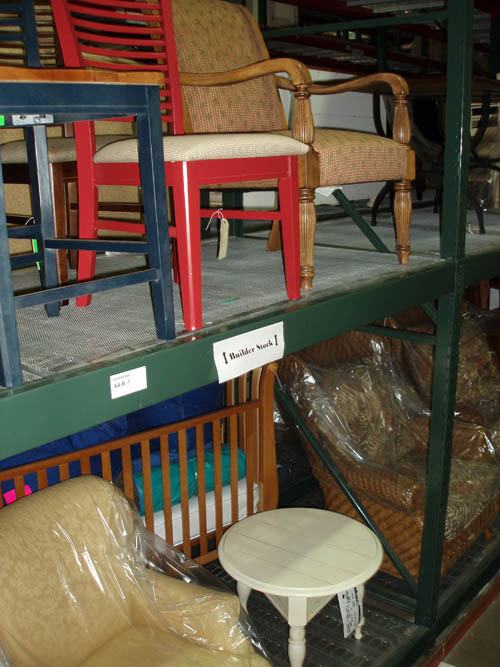 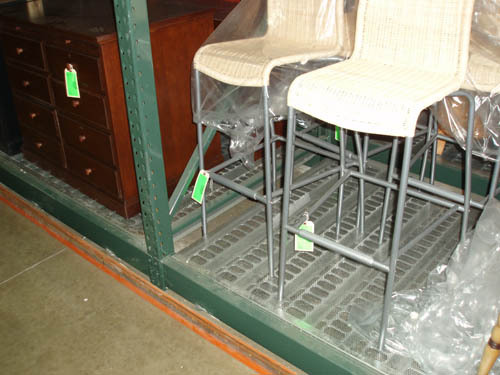 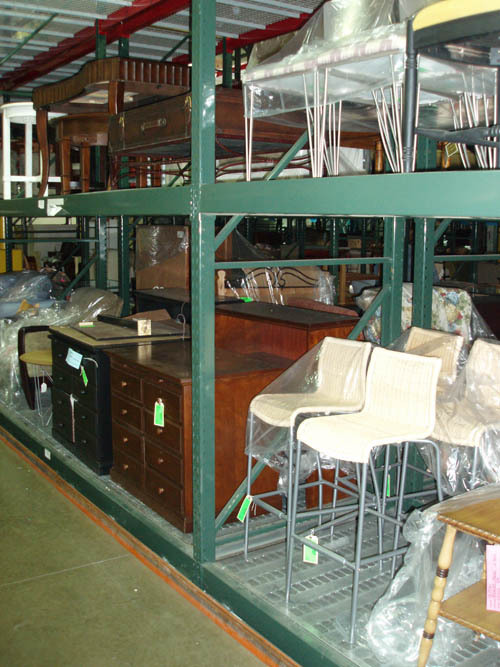 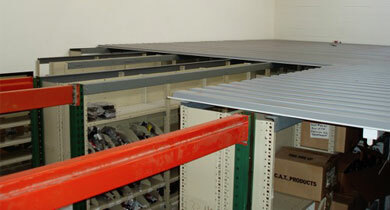 The Solid Flat-Cap is an accessory, add-on for the Solid pallet rack decking (no water drain holes). 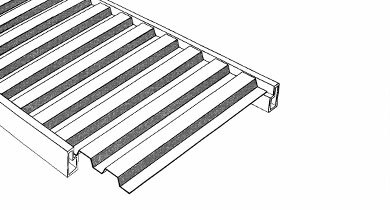 Solid Flat-Caps are the solution for those applications that require a smooth flat-surface with products that might snag or fall through other decking surfaces. 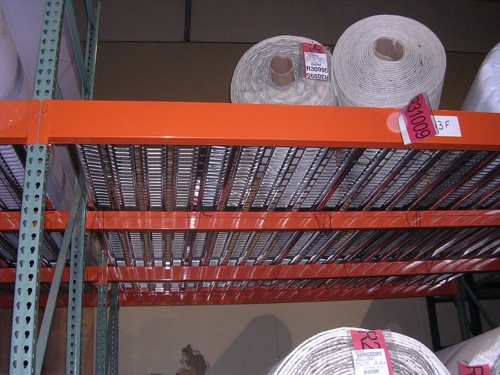 Available in a variety of steel gauges and provided a durable Galvanized finish. 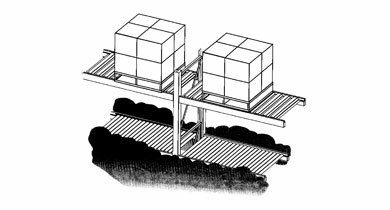 22, 20, or 18 ga. 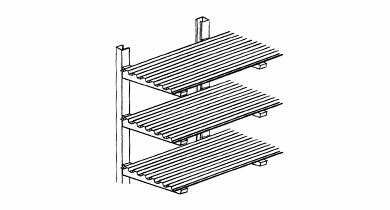 The decking may lay across the top of the cantilever arms and run "down aisle". 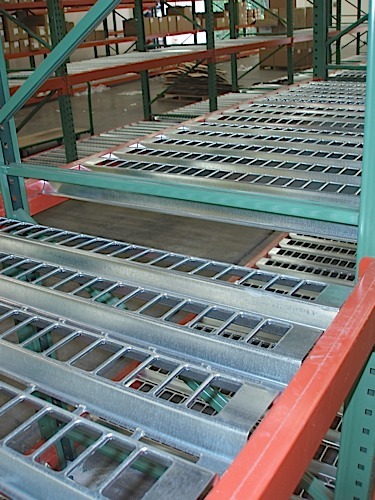 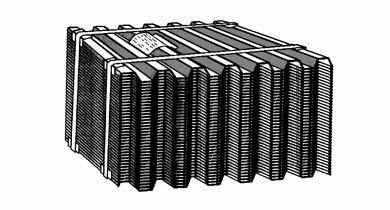 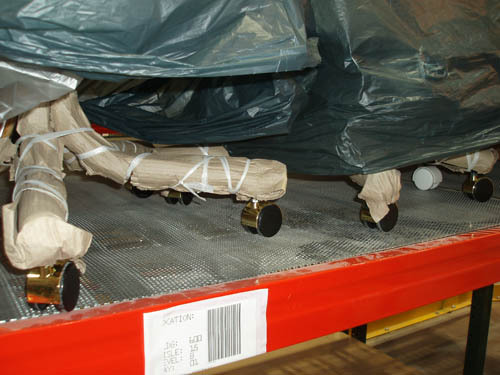 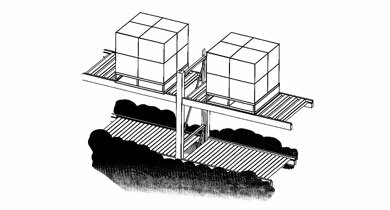 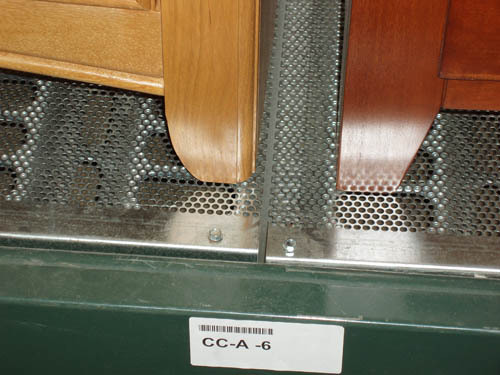 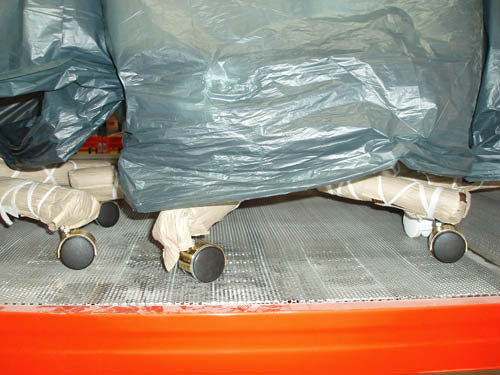 The decking may also be installed in cantilever arm "saddles" and thus work much like regular pallet rack, running "front to back". 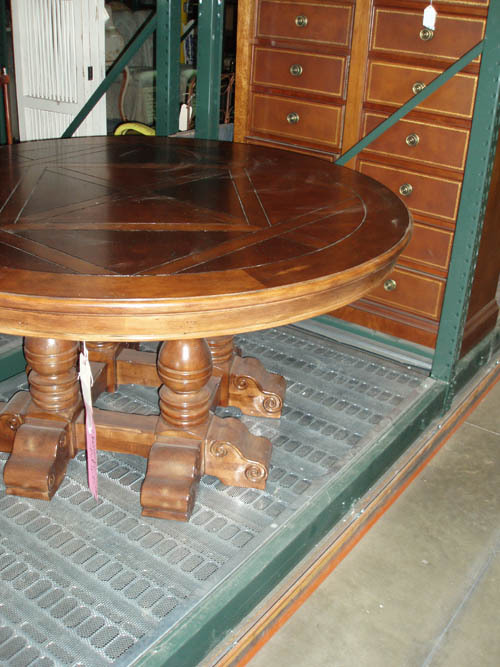 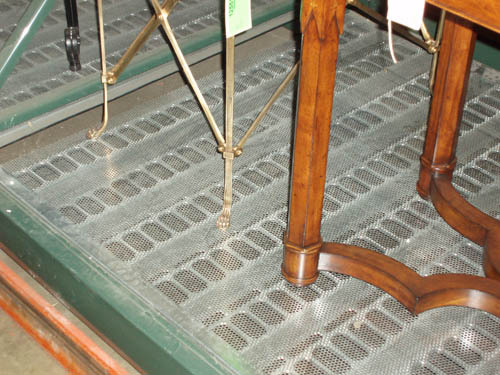 The decking may be provided with or without water drain holes and with or without our flat-cap accessory. 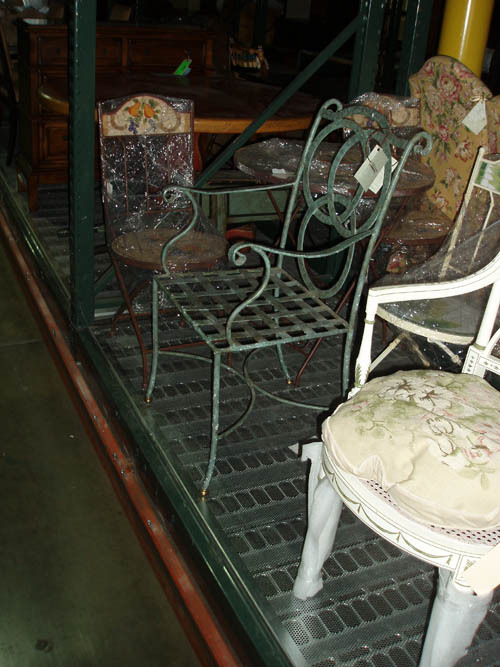 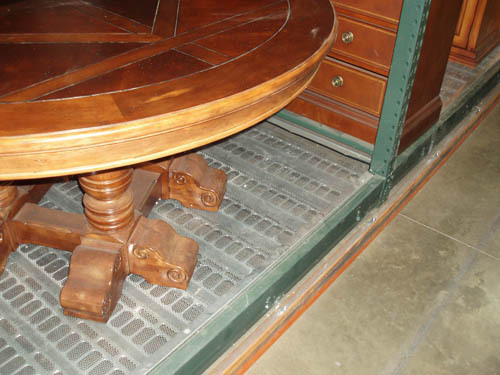 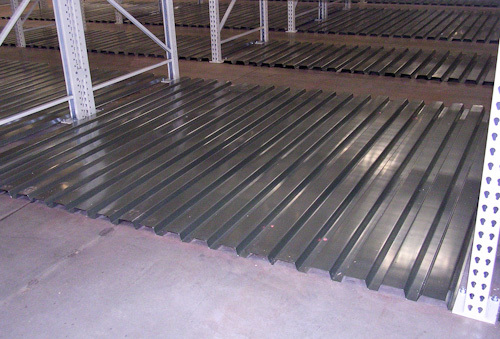 The decking is available in a variety of steel gauges and is typically provided in a durable galvanized finish. 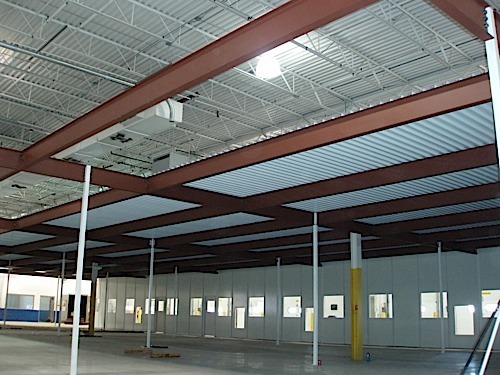 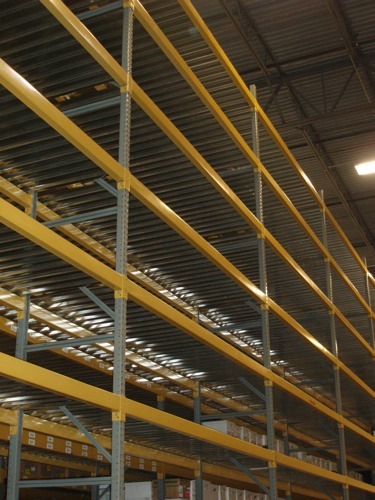 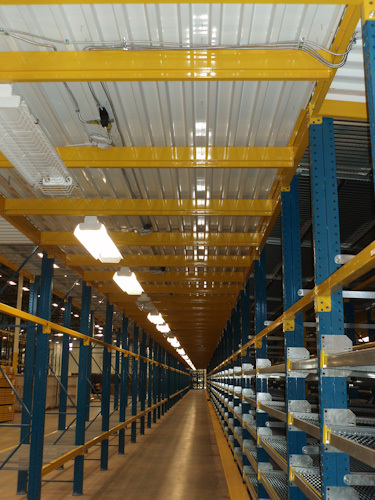 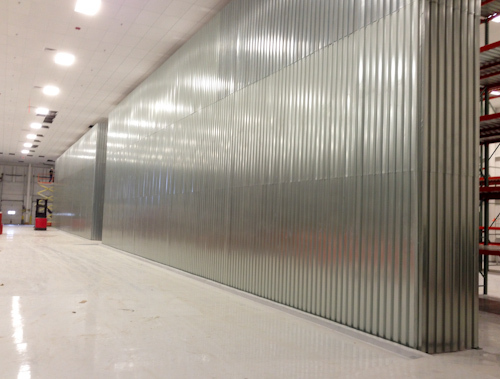 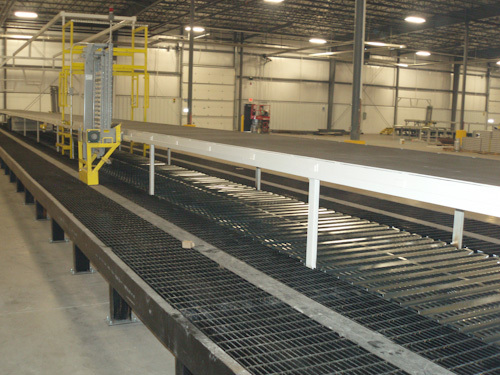 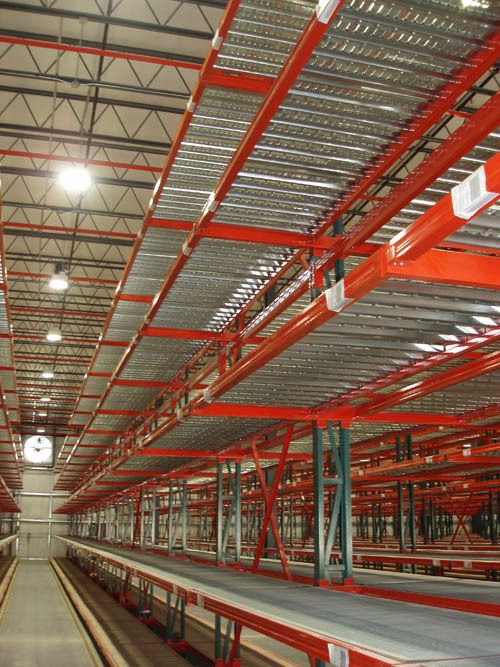 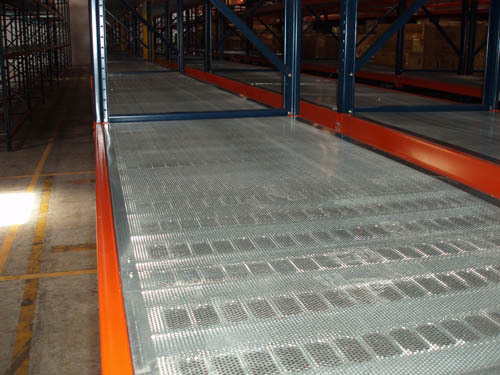 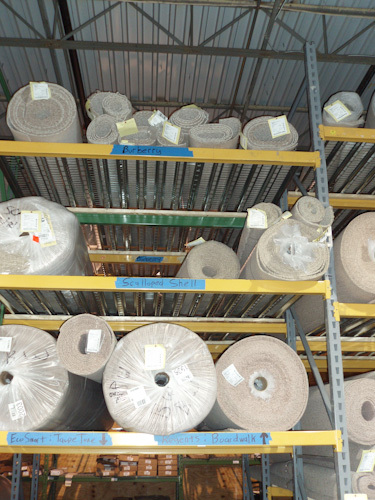 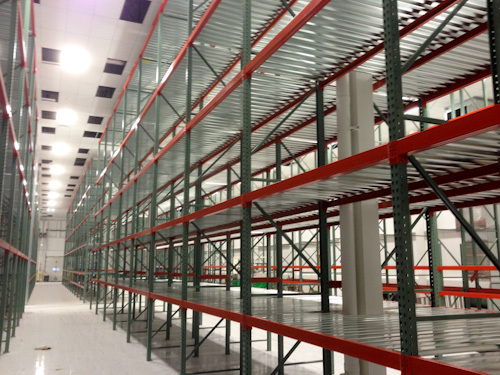 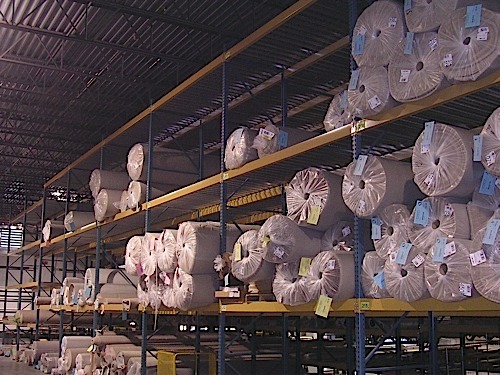 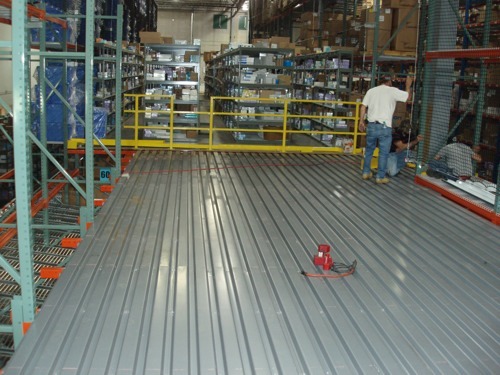 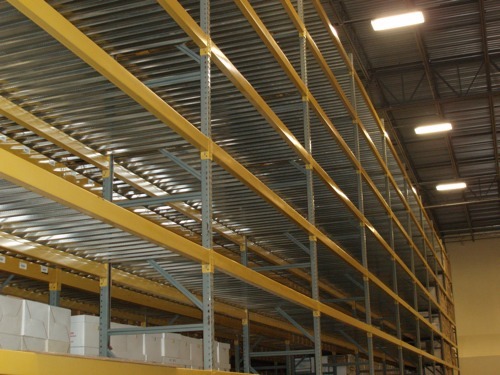 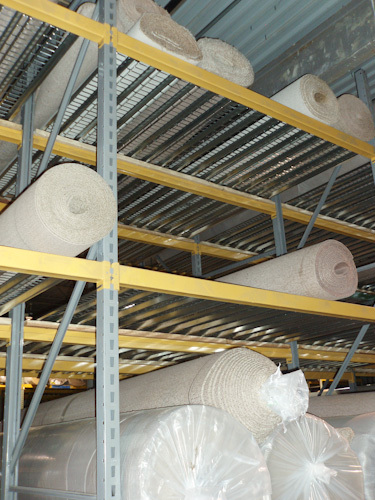 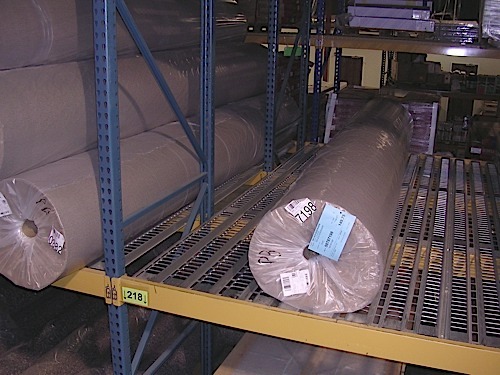 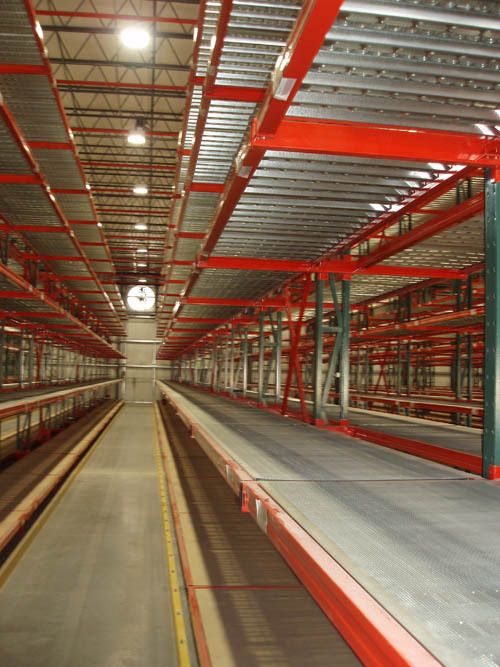 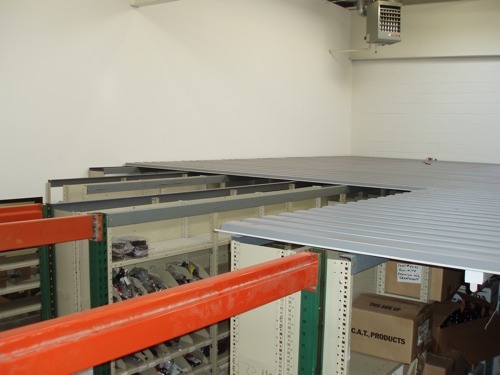 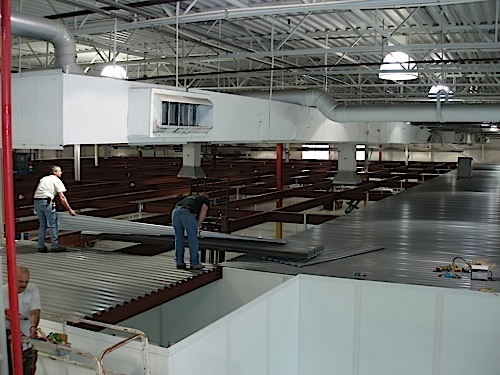 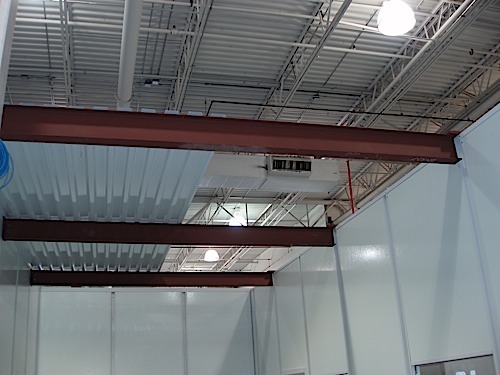 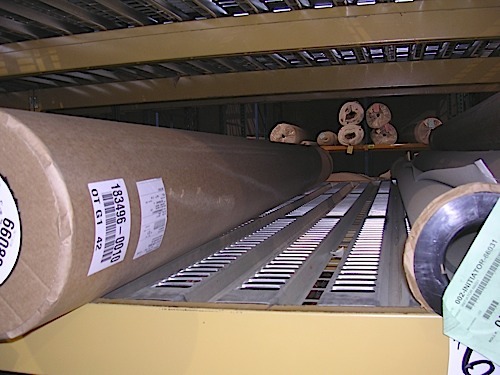 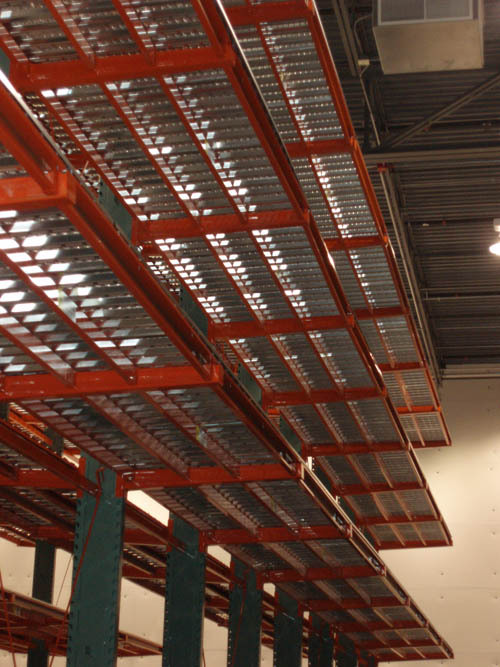 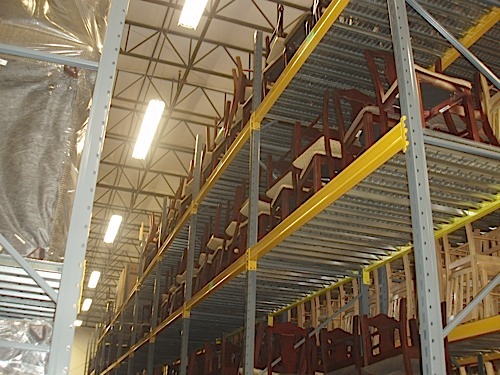 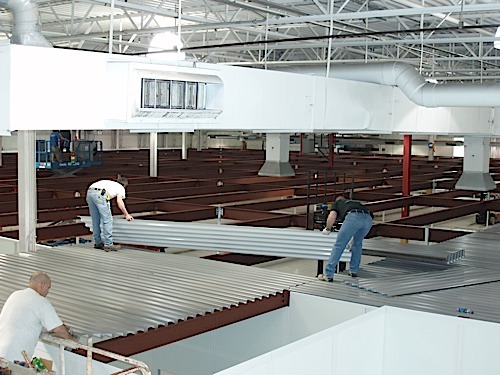 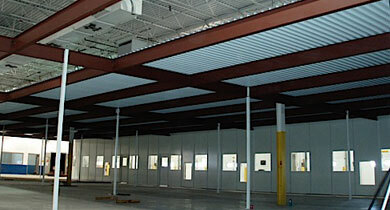 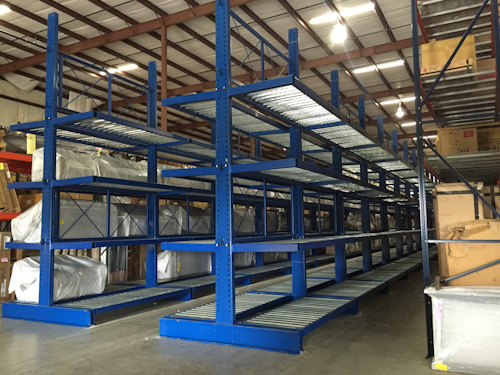 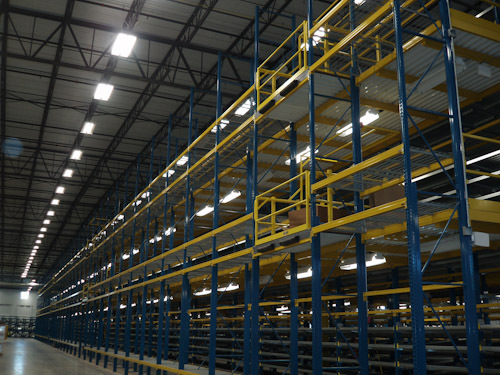 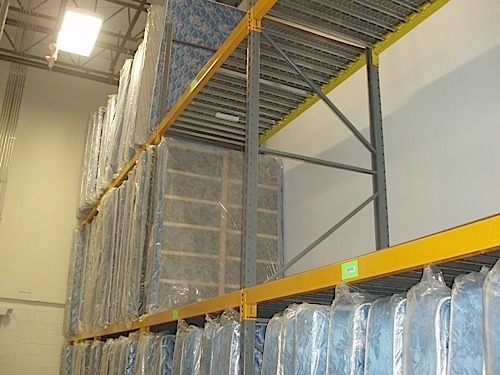 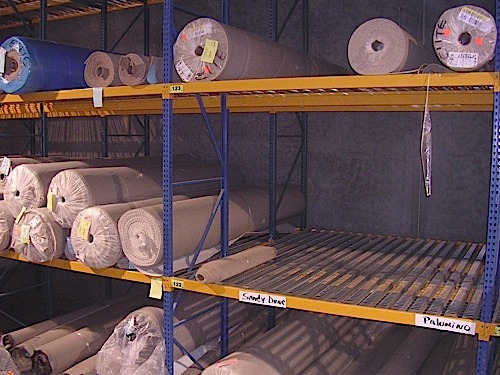 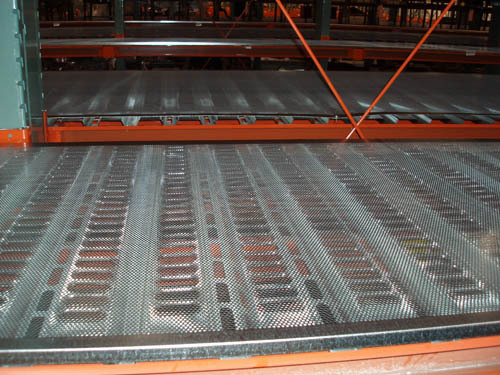 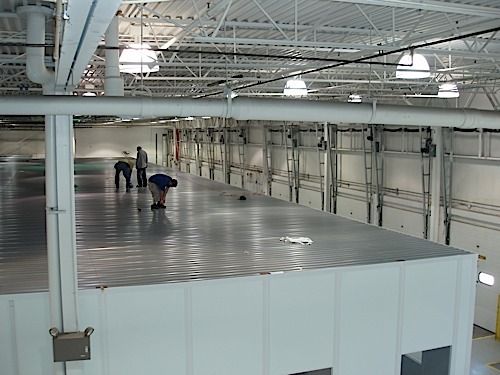 Any length 12" to 30 ft.
For years our "B" deck long length panels have been used for: mezzanine sub-flooring, cat-walks, pick-modules, utility landings, etc. 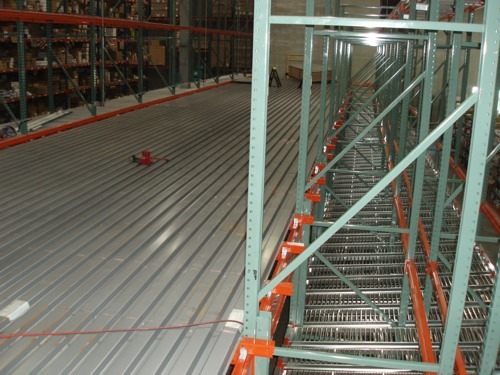 Finished flooring is placed on top. 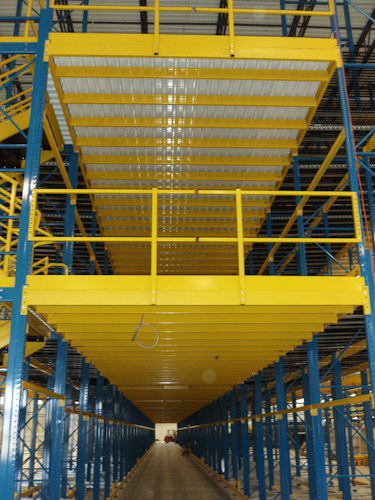 Our mezzanine decking is typically provided with a painted bright white underside for a nice reflective finish. 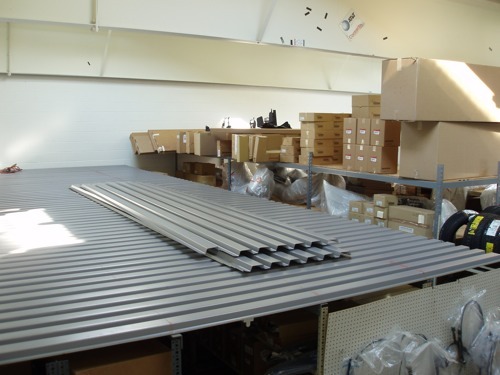 We can roll-form any long length you require to fit your support beam layout, which saves you money with less overlap in the length. 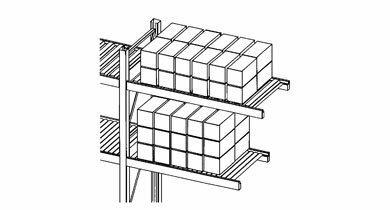 With multiple panel widths available, we can also save money by designing the layout with little or no overlap on the width dimension as well. 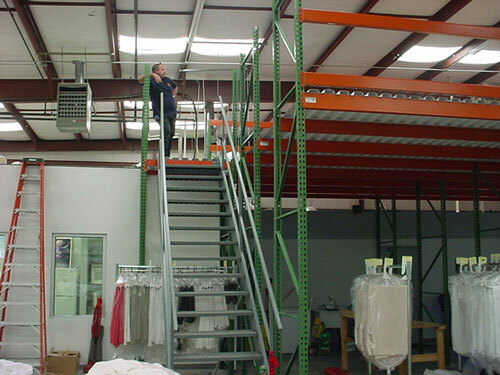 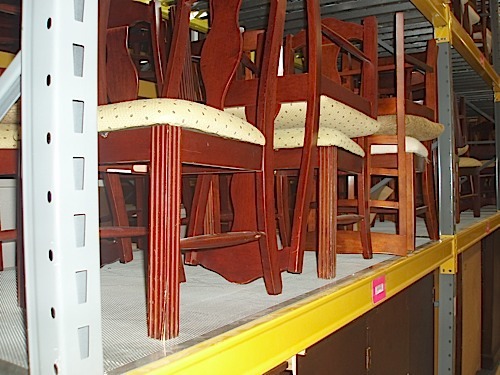 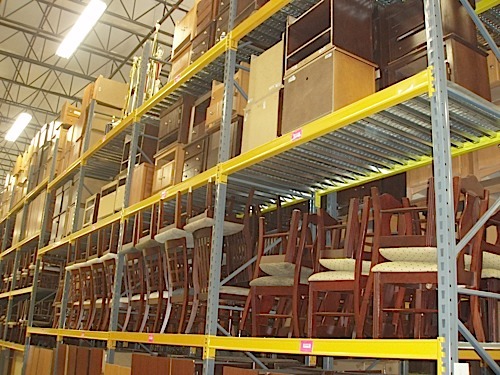 We can provide assistance in jobs ranging from multiple truckload jobs to smaller projects involving a few pcs. 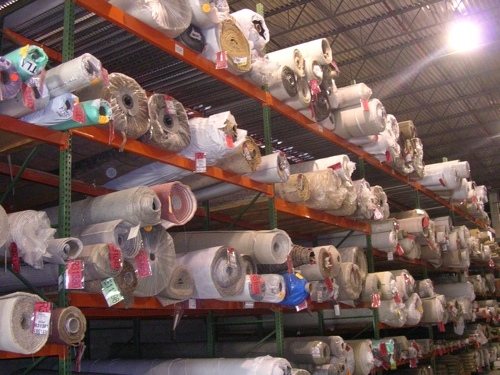 Call for a quick quote. 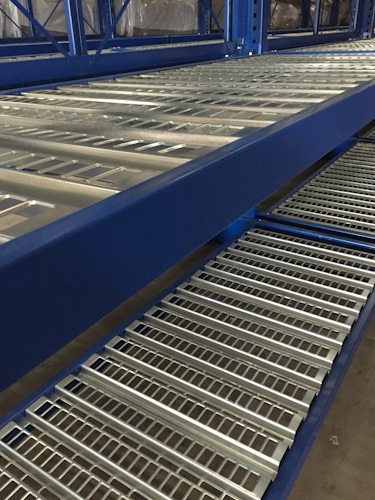 We can provide a wide range of loading capacities and the panels may be roll-formed and cut to virtually any length you require. 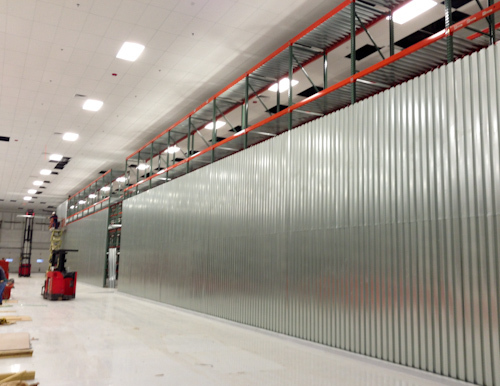 Panels provide a quick easy install. 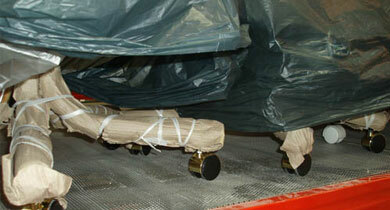 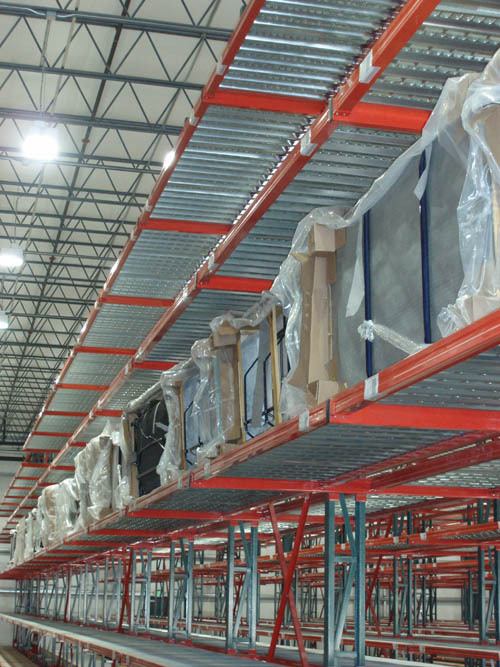 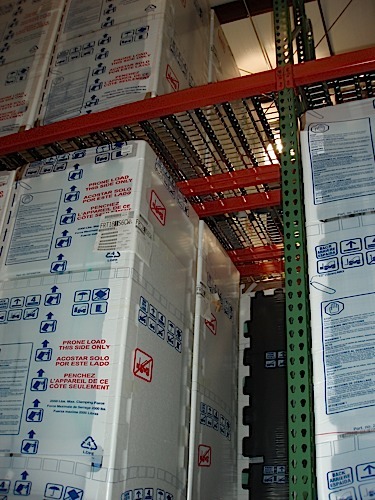 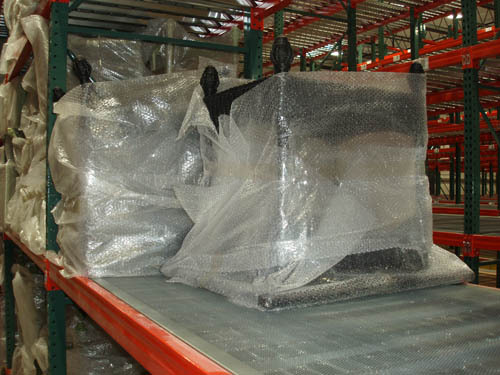 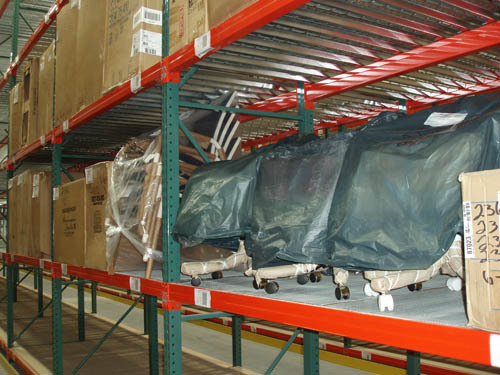 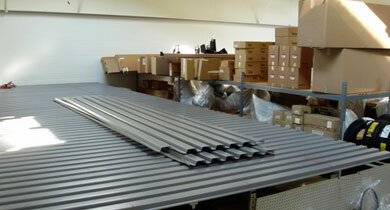 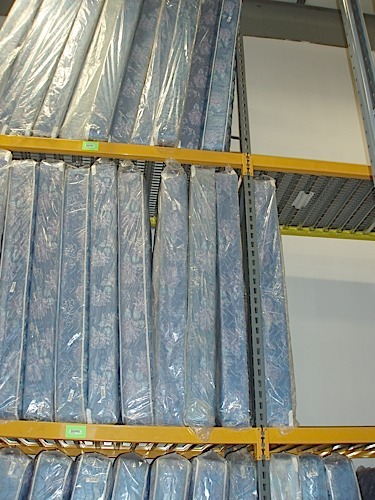 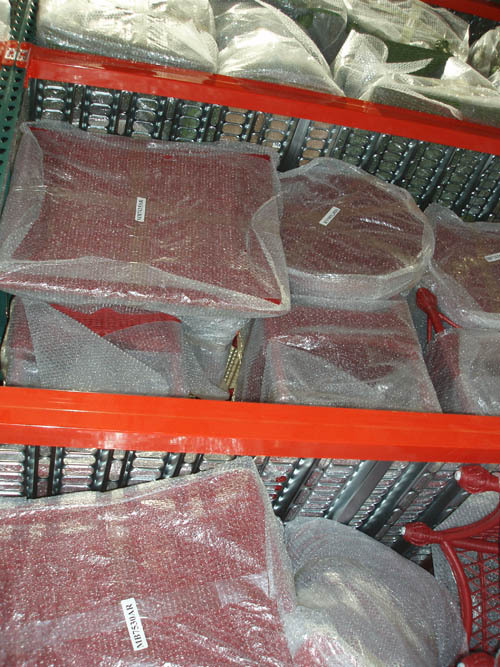 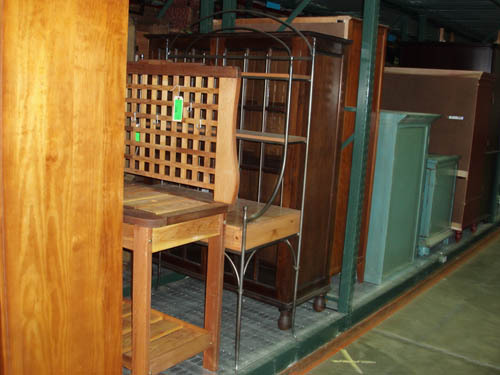 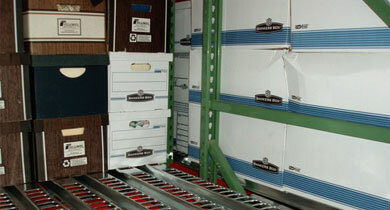 The panels are shipped nested in a small palletized bundle for low freight cost & easy handling. 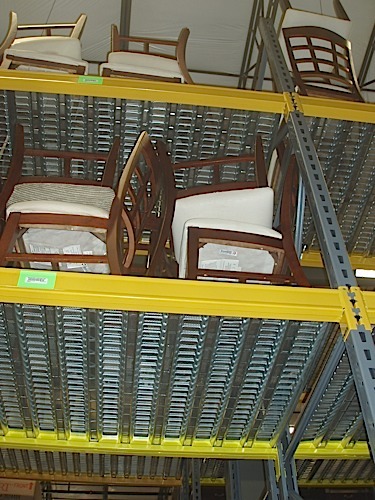 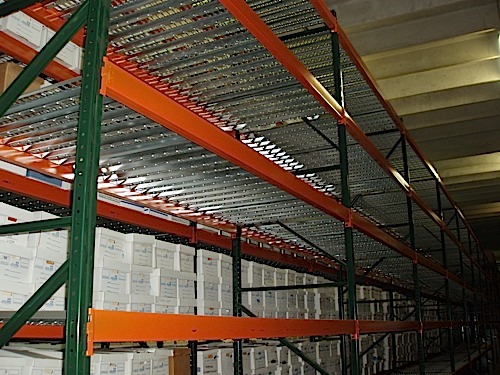 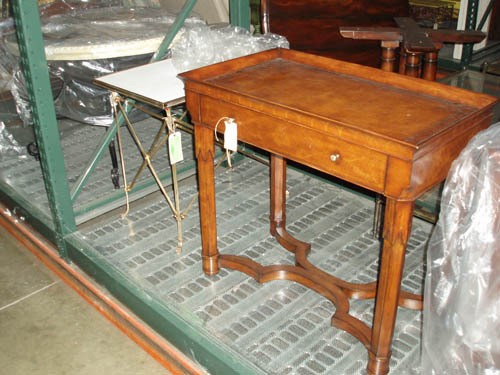 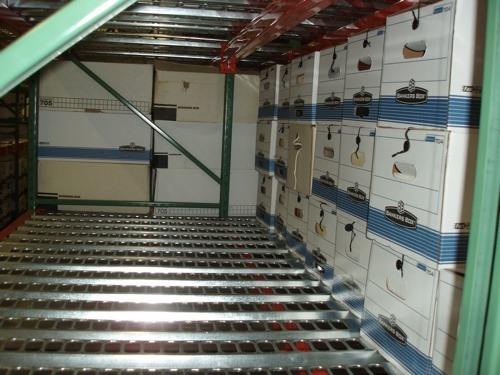 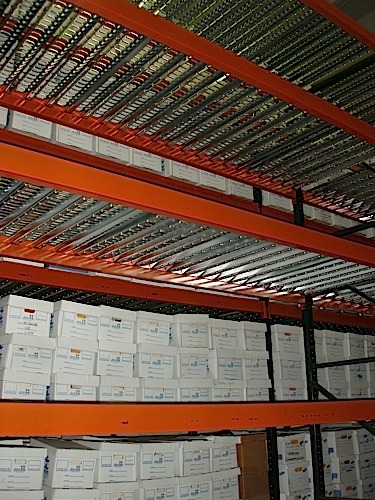 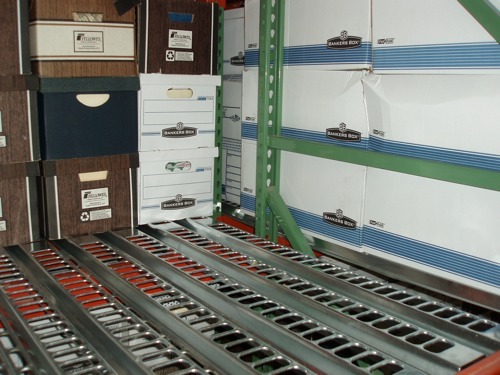 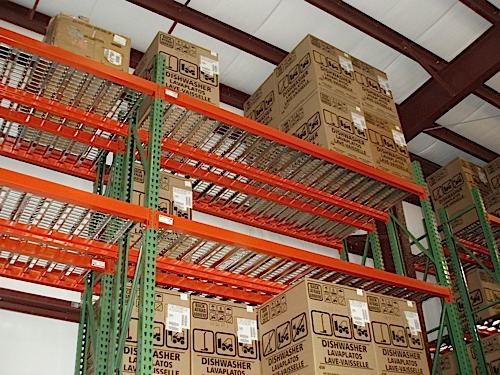 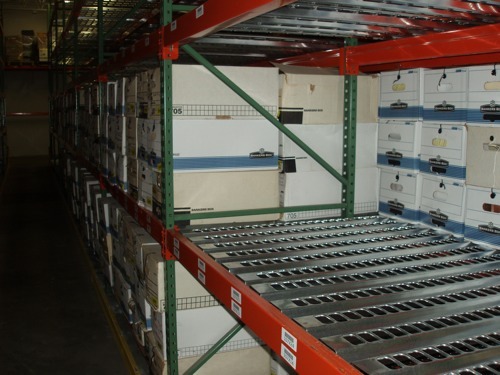 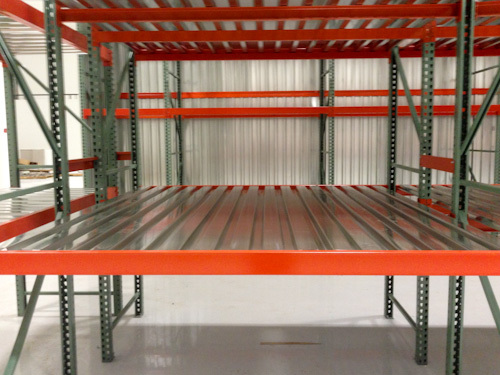 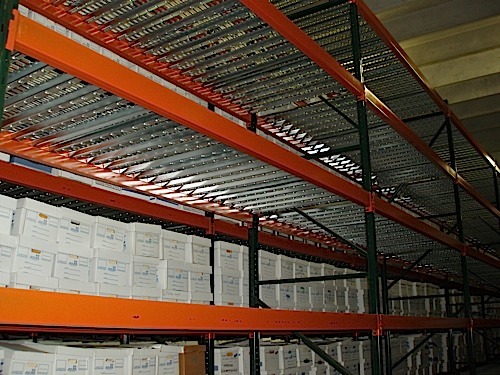 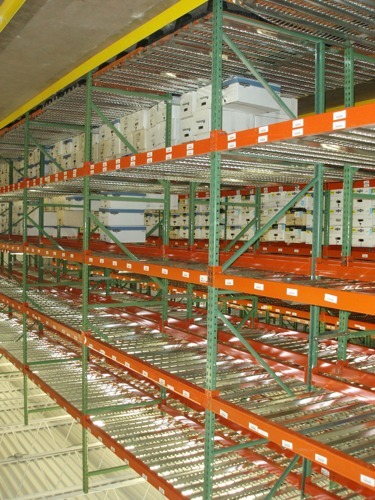 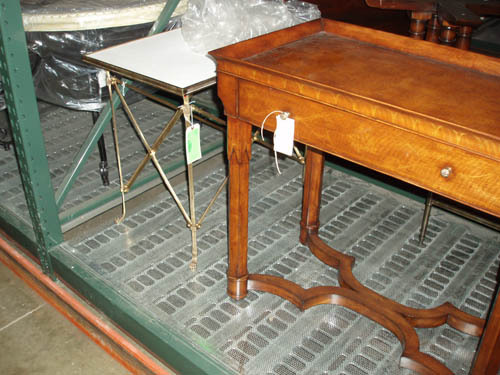 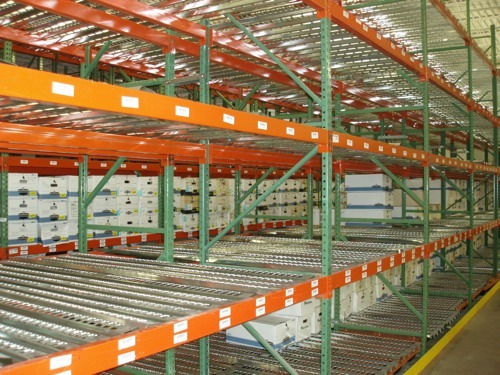 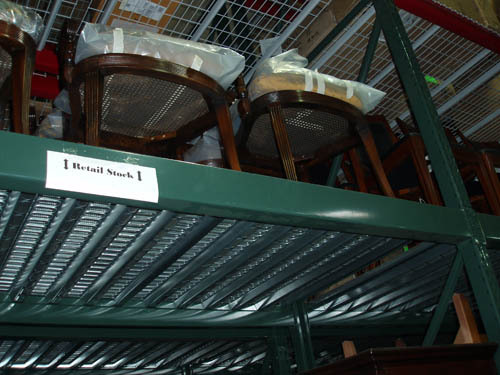 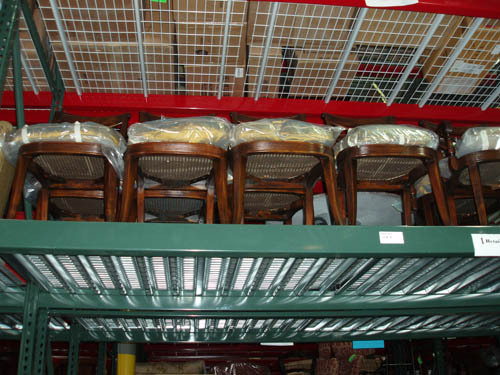 Photo Gallery Rack Deck "In Use"